Last week as I sat feeling slightly down in the dumps in the supermarket car park I decided to have a quick Facebook look. Cub had just fallen asleep as I pulled into the space and I wanted to give him at least five minutes before I tried moving him. 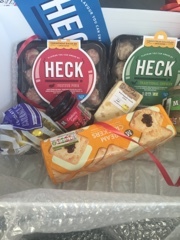 Three days later this amazing hamper arrived! 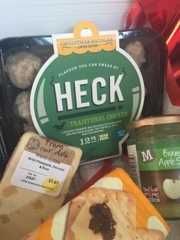 I was so pleased, we received some chicken baubles and some pork Ones as well as crackers, cheese, sauces and chocolates. 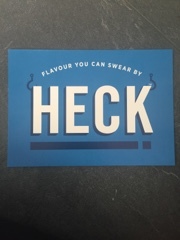 I cannot wait to use these Heck balls at Christmas but for now we decided to try them in a few different ways. They definitely aren't just for Christmas! 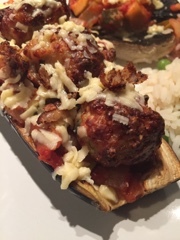 So first up we had chicken baubles nestling on an aubergine boat. I cooked the Heck in the oven for 25 minutes and constructed it all afterwards. They are fairly fluid whilst raw but surprisingly ball like when cooked and they are delicately flavoured so very versatile. We ate them with stuffed mushrooms and rice. The best bit is (seeing as I'm a slimming worlder) that they are 1.5 syns per bauble so they aren't breaking the bank. 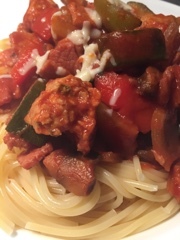 They freeze well and so we used the last of them in a spaghetti bolognese and again they didn't disappoint. They even had to compete with some smoked bacon lardons and they held their own. Next we'll be trying the pork baubles so watch out as I'll try and incorporate them into some different meals. 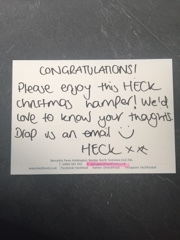 So thank you Heck...we love them.